In their day, they didn't consider themselves herioc. 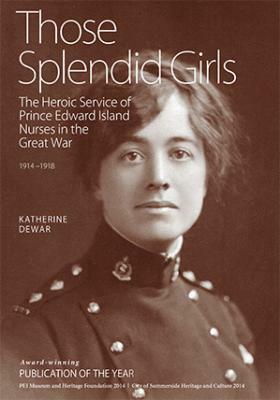 But 100 years later, and knowing better the horrors they endured in the First World War, Those Splendid Girls salutes the courage of all Canadian nurses who served and redresses a century-old wrong: the absense in the historical narratives of P.E.I. - and of Canada - of the contribution of nurses to the First World War. Over 115 women from Prince Edward Island answered the call to the war, and many of their names were unknown until now. Granted rare access to personal diaries, letters home, and wartime photo albums tucked away in dusty attics, Katherine Dewar has pieced together Island nurses' stories of hospitals, bombing, fear and friendships, to deliver this powerful new account of the Great War. At war's end, many Island nurses were unwilling to swap their wartime autonomy and authority for housework and poorly paid nursing positions on P.E.I. ; instead, they received senior appointments in nursing schools and in hospital administration, most often in the "Boston States" and in California, and through these, made lasting contributions to the profession of nursing in North America.